A signed and dated print from an original painting by artist Robert Toth. Barnegat Light (Old Barney) is located at the north end of Long Beach Island, New Jersey. Barnegat Light, the second tallest lighthouse in the United States, 165 feet above sea level, was commissioned January 1, 1859. It remained a first-class navigational light until August 1927, when the "Barnegat Lightship" was anchored 8 miles off the coast. The tower's light was reduced 80 per cent, but it was not extinguished until January 1944. 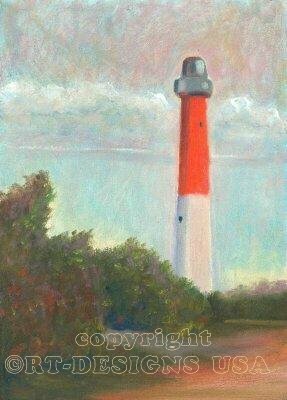 Today the Barnegat Light is affectionately known as Old Barney. In 1988, the lighthouse was closed for repair; re-opening for visitors in 1991. The lightship was removed in 1965, made obsolete by electronic navigation. This series of impressionist landscapes was inspired by Robert Toth's study with Henry Hensche at the Cape School of Art, Provincetown, Mass.